Little, Brown and Company, 9780316375108, 336pp. The reclusive Harriet Wolf, revered author and family matriarch, has a final confession-a love story. Years after her death, as her family comes together one last time, the mystery of Harriet's life hangs in the balance. Does the truth lie in the rumored final book of the series that made Harriet a world-famous writer, or will her final confession be lost forever? Harriet Wolf's Seventh Book of Wonders tells the moving story of the unforgettable Wolf women in four distinct voices: the mysterious Harriet, who, until now, has never revealed the secrets of her past; her fiery, overprotective daughter, Eleanor; and her two grown granddaughters--Tilton, the fragile yet exuberant younger sister, who's become a housebound hermit, and Ruth, the older sister, who ran away at sixteen and never looked back. When Eleanor is hospitalized, Ruth decides it's time to do right by a pact she made with Tilton long ago: to return home and save her sister. Meanwhile, Harriet whispers her true life story to the reader. It's a story that spans the entire twentieth century and is filled with mobsters, outcasts, a lonesome lion, and a home for wayward women. It's also a tribute to her lifelong love of the boy she met at the Maryland School for Feeble-minded Children. Harriet Wolf's Seventh Book of Wonders, Julianna Baggott's most sweeping and mesmerizing novel yet, offers a profound meditation on motherhood and sisterhood, as well as on the central importance of stories. It is a novel that affords its characters that rare chance we all long for--the chance to reimagine the stories of our lives while there's still time. Julianna Baggott is the author of numerous novels, including Pure, which was a New York Times Notable Book in 2012. Her poems have been reprinted in Best American Poetry, and her essays have appeared in The New York Times Book Review, The Washington Post, The Boston Globe, and on NPR's All Things Considered. She teaches at the College of the Holy Cross and in Florida State University's College of Motion Picture Arts. "Many things are hidden in Julianna Baggott's intricate, tenderhearted novel about a writer, her children, and a legacy of loss . . . The narrative Baggott has built might be described as a post-and-beam structure, a framework of sturdy supports locked into place with no nails, just fine, firm dovetail joints.Within it, the four women who make up Harriet's family alternately tell their stories, giving us a variety of perspectives on her 'gappy grasp of the world" . . . As distinctively twisted as these characters' lives are, they still touch our own in ways that can be unexpectedly playful . . . By the end of Harriet Wolf's Seventh Book of Wonders, much comes out of hiding. Healing cascades down the generations. Harriet's 'truthful kind of lie' turns out to be a gift to her daughter [Eleanor] . . . Eleanor and her daughters will all find a new ending to their story, and remind Baggott's readers of a gorgeous truth: 'The world is astonishing, mainly because of its persistence.'" "Some novels are a lot bigger inside than out. Case in point: Harriet Wolf's Seventh Book of Wonders....[which] signals a quantum leap....It took Baggott eighteen years to write, and that's believable. This sprawling tale covers the entire twentieth century and multiple literary styles. It is not dense, however, and it can be enjoyed by readers who know nothing of deconstruction or semiotics....Readers will be reminded of the work of John Irving (especially Cider House Rules) with touches of F. Scott Fitzgerald....One thing is certain: Nobody will be bored." "Julianna Baggott can do anything with words. Anything, I tell you... Wonders is deliberately, playfully strange. It has been made scrumptious with oddities of every conceivable sort....Baggott takes the time to speak truly-about love, about books, about fame, about what it is to be alive." "All stories worth telling are love stories, a character says in Harriet Wolf's Seventh Book of Wonders. This novel about a famous writer's lost manuscript, the complex legacy of family secrets, and--yes--a love story that unfolds across generations is inventive, playful, and deeply affecting." "Julianna Baggott's latest novel refuses to be confined to only one genre. 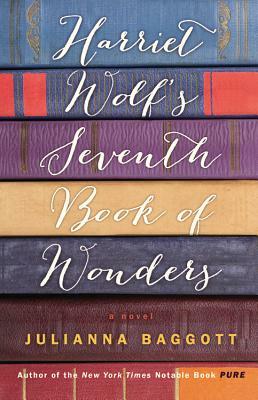 Harriet Wolf's Seventh Book of Wonders is a captivating multigenerational family saga, a love story, and a mystery-tinged with a bit of fantasy . . . Baggott's mesmerizing tale of the resilient ties of motherhood and the bonds between sisters will resonate with a wide variety of readers."